Nissan Hardbody Pickup off road winch bumpers are a useful thing to have on the trail. Nissan Pathfinder Off Road bumpers offer heavy duty protection of the front on your Nissan Hardbody Pickup against various elements that you may encounter on the trail. 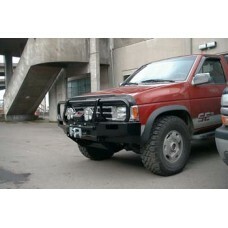 These Nissan Pathfinder off road bumpers also usually have provisions for adding a recovery winch. Fits years 1991, 1992, 1993, 1994, 1995, 1996, 1997 Features: Recessed Indicators, Tow Points, BlackThe harsh conditions of the Australian Outback are extremely demanding, and standard brush guards a..